UFO crew displays its dislike of the rule requiring all UFOs to by fueled by burning coal. 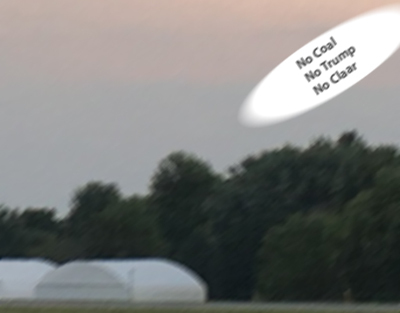 Enraged by Melania Trump’s announcement that visiting UFOs must be fueled by coal, thousands of aliens protested and rioted at Bolingbrook’s Clow UFO Base. While coal can be used to fuel some alien reactors, the new coal requirements say any alien craft landing at an Illuminati controlled UFO Base must be fueled by burning coal. Mrs. Trump explained in a video presentation: “We have taken away Appalachia’s economic development funding, their clean water, their clean air, their health care, and their environment! It is only fair that you take and burn their coal!” She added that since natural gas is so cheap, it is unlikely that there will be any new coal plants built in the United States. Following the announcement, thousands of aliens marched to the Illuminati embassy to protest. 300 were arrested for attempting to breach the forcefield. Others chanted anti-Illuminati slogans and called for the New World Order to retake Clow. While there were no fatalities from the attacks, dozens of security personnel were treated for exposure to stink bombs. The violence and protests subsided once it was announced that the coal requirements were suspended until the Interstellar Trade Organization could review them.